Keeping your password and private information safe on the internet has never been more fraught. From hackers to identity thieves, it's easier than you think for an account or password to be infiltrated. Google aims to help that problem with its newest Chrome extension. 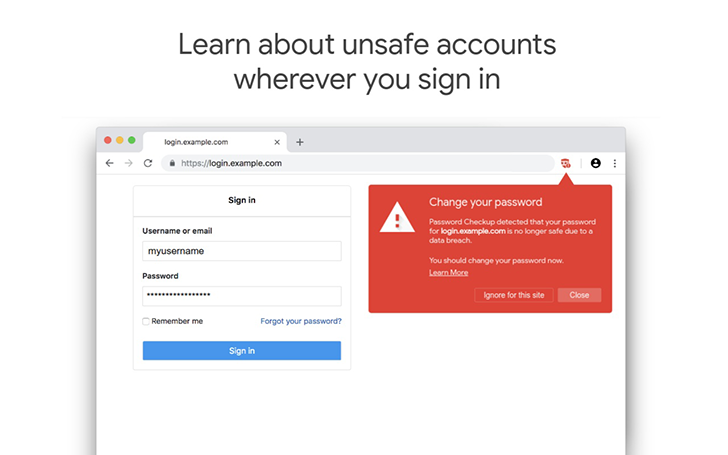 Google's new Chrome extension Password Checkup aims to ensure that your password is never compromised without your knowledge. If it detects that your password or account is unsafe you'll get an automatic warning informing you that you ought to change your password. Google has also added cross-account protection, in an attempt to keep you protected while using apps that require your Google account to log in. Those other apps need to opt-in to cross-account protection and once they do they will receive information in cases of account hijacking or security concerns. Google will limit disclosures to only share that these security events have occurred, without sharing personal account info.